I’m back with a beauty product review!! I was sent the Klairs Illumination Supple BB Cream from WishTrend 2 months back and have since used it enough for a proper review! This BB Cream comes in a 40ml slim tube which makes it easy to carry around! It also have SPF 40 PA ++ which is not too bad. Here’s a swatch of the BB Cream on black surface. It is of a light tone, and is suitable for most skin tones as it’s of a neutral tone. A swatch against the back of my hand. The texture of this BB cream is rather light yet still creamy. It blended in well and coverage is pretty good as it can cover up my redness. I blended it out thickly then thinly towards the left of the hand. A light layer give you that dewy look and if you need more coverage, just add on a bit more product and blend. Here’s me wearing the BB cream with just loose powder and a little blush. No filter on this photo, taken under natural light. It covers up my redness pretty well and even the skin tone well. Does not appear too pale as this BB cream blends with your skin color. This BB cream is pretty much in my favor in terms of coverage and texture as it feels really light on the skin. But oil control wise, it only lasted about 2-3 hours before I oiled up in my T-zone. So you might want to avoid this if you have oily combination skin like mine. I would recommend it for those with Dry to Normal skin types. I have tried this on someone with dry skin and it looks really good. Hi all! Am here to share my Korean Goodies from http://www.wishtrend.com/! More skincare and bodycare added to my collection! First up is this Gentle Moist Aloe Gel from Klair’s! It’s actually a moist for hydrating purpose and also great to use to sooth out burns! Check it out here http://www.wishtrend.com/klairs/260-klair-s-gentle-moist-aloe-gel.html! I’ve also received a small sample of Raclia ‘s Night Spot Care, for pigmentation. Also do check out http://wishtrend.net/ for interesting post and visual makeup tutorials! Don’t forget to sign up an account over at http://www.wishtrend.com/ too! You can use the coupon above! Don’t waste it!! Detailed review of products will be up at a later time! Hi all! Some of you might remember that I’ve once did a collaboration with Wishtrend on a blind test project some time back. Wishtrend is now sponsoring Korean skincare and cosmetics monthly to a group of bloggers and I’m one of them. Let’s cut the story short and check out what they have sent me this month! I’ve received a full sized C Plus Brightening Vitamin Cream which is one of the top 3 best sellers in the Skin & Lab range on Wishtrend.com. As the name suggest, it’s a Vitamin C cream that helps to improve skin tone and brightening. I’ve also received samples of various vitamin creams in the Skin & Lab range of products. How does Skin & Lab products work you might wonder. There’s Vitamin A for firming, B for acne, C for brightening, E for moisture and K for redness. You can mix and match the vitamin cream and apply them according to your skin condition. For example, using B and K together when targeting acne. B to help treats the acne and K to reduce the redness left or caused by acne. As our skin condition changes from time to time, there’s never one product that will work for us forever. With Skin & Lab range of vitamin cream, we can target different problems by using a different combination mixed on our own. Skin & Lab products ranges from USD 10.99 to USD 25.99. The full set of vitamin cream cost USD 63 which is very worth as each individual tube cost USD14.99 to 15.99. Wishtrend is offering a USD5 discount to all newly registered account. So take this chance to make use of the discount and happy shopping! Discount code below! Quite excited on what will I receive next month! Can’t wait! This is a super overdue post!! Firstly, a swatch of all the 5 samples. You can see that all 5 samples differs by color and texture. Some with yellow under tones, pink undertones, neutral tones. Some are creamy, some are thick and some are runny. I did a half face swatch for the samples. Surprisingly, D is not as white as I thought it would appear on my face. It actually have good coverage too and brightens up my complexion. A blends in well with my skin tone and have average coverage. B has good coverage, brightens up my skin tone. C blends well but coverage is average. E’s coverage is quite good but the shade is actually a little too light for me. I would say B and D is the better ones in terms of coverage. However B wins in terms of texture and smell. D has quite a strong smell. There are 13 other bloggers involved in the test too! Check out the overall results here! Wishtrend BB Cream Blind Test Results! Wishtrend just came out with a new product! Check out out here too! 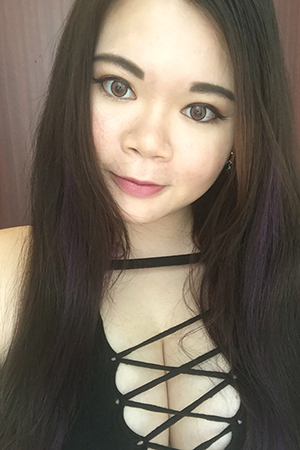 Hi everyone, here to share with you about my second blind test experience with WishTrend! Received the test subjects in their signature Wishtrend Box! So I have Black, Black+White and White. Let’s find out which I like best! Can see that BW and W is the more pigmented ones. They are also the one that glides on better. After wiping off with a tissue. My favorite out of the three liners would be the BLACK and WHITE one. Reason being it’s the one with the smoothest application and is smudge proof. Plus it’s also really pigmented so that’s no need to go over a few times to get the intensity. I also like how it can be cleanse with water as it means that I can remove it more easily as compared to the other 2. Although it might be a minus point that it can be remove with water but its fine without any rubbing actions. The WHITE one would be the one that is an all rounder with and high average score for all categories. The only downside of this liner is that you need to apply at least twice to achieve the desirable pigmentation. The BLACK one is the one that scores the best in waterproof-ness and is good for those looking for something that is water resistant. However, the downside is that it can be smudge easily. Pigmentation of this liner is not as good as the other 2 but it’s a relatively good liner suitable for day use. Curious to find out which liner is from which brand? Check out WishTrend Report on the 2nd Blind Test!